Home Nutrition Weight loss Food Sensitivity Testing: Is it right for you? Food Sensitivity Testing: Is it right for you? Do you suspect that certain foods don’t agree with you or are preventing you from achieving optimal wellness? If so, Food Sensitivity Testing might be right for you. This post was created in collaboration with our friends at EverlyWell. Sometimes it’s not what you put in but rather, what you take out. One of our goals as dietitians and influencers in the nutrition and health space is to help readers reach their optimal place of wellness. To get there though takes time, experimentation and testing. Sometimes that testing comes in the form of more subjective methods like an elimination diet (or a Whole30 with reintroduction), tracking macros for a short period of time, or modifying your carb or fat intake. Other times it involves more objective data collection like testing. All of these offer valuable insights into your health but some can provide more accurate data in a shorter period of time. Such is the case with food sensitivity testing. Food sensitivity testing is not the be all end all, but it can give you a place to start from. Rather than stabbing in the dark as to which foods aren’t working for you, testing can give you a good idea of which foods are suspect and which ones you can eliminate right off the bat then reintroduce at a later time. Uncover which foods may be keeping you from feeling your best – at home! 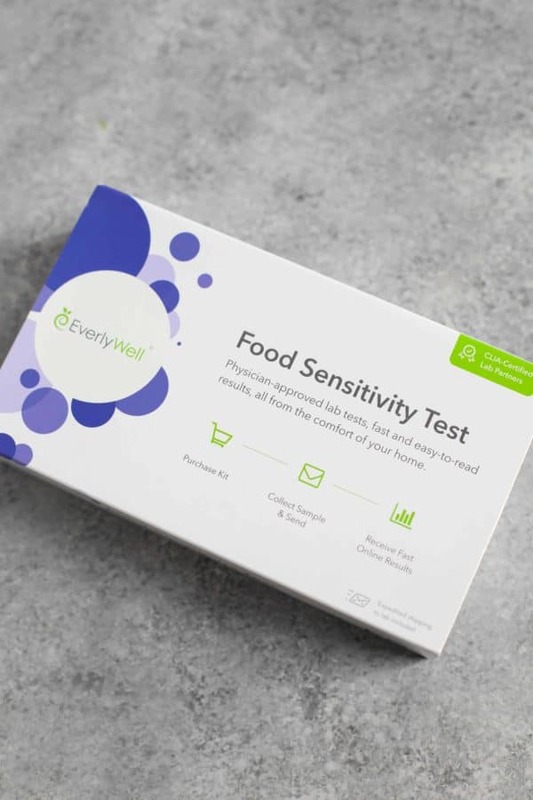 Meet EverlyWell, the quick and easy answer to uncovering food sensitivities. EverlyWell makes lab tests easy with 30+ at-home kits – from fertility to food sensitivity – ordered by you. Their tests offer simple, sample collection, free shipping, and physician-reviewed results and insights sent to your device in just days. We recently had the opportunity to try out the food sensitivity test kit and found it to be a great way to collect data about one of our favorite subjects – ourselves! Not only are the test kits from EverlyWell easy to use and affordable, but you also get accurate, physician-reviewed results from a CLIA-certified lab. You’ll also get access to their online dashboard where you can see all of your results in one place, share with your provider, download a pdf for your records or to share with others, and get valuable insights and recommendations for ways to address your food sensitivities. Keep in mind, the ultimate goal is to enjoy the most varied diet possible so testing allows you to do that without the guesswork. They recommend eliminating the offending food(s) for 30 days then gradually re-introducing a new food every 3-5 days to evaluate for symptoms (if any) then repeat with the remaining foods. See for yourself just how easy at-home food sensitivity testing can be. I’m no stranger to food sensitivities. In fact, in my own journey to optimal wellness, I’ve taken plenty of tests to help me better understand what was keeping me sick (read: what was continually triggering flares of my autoimmune disease). I even ran a private nutrition practice specializing in food sensitivities because I was so passionate about helping others uncover important information about their own health! 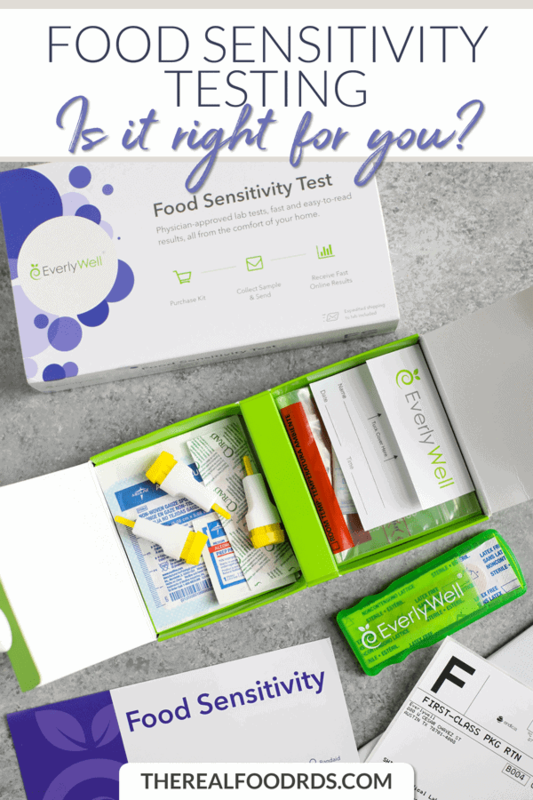 The EverlyWell Food Sensitivity Test Kit was by far the easiest test I’ve taken. I did it at home, on my schedule with no blood draws – just a simple finger prick. And everything I needed, right down to the band-aid and the postage-paid return envelope and label were provided by EverlyWell. It was so easy and the results were insightful (I turned out to be mildly reactive to gluten, wheat, yeast, scallops, green beans, green peas, wheat bran, sesame, and malt, in case you’re wondering). EverlyWell offers a wide range of test kits for general wellness, energy + weight, women’s health, men’s health, women, sexual health and genomics. Popular nutrition-related tests include Thyroid Test, Metabolism Test, and Vitamin D & Inflammation Test. 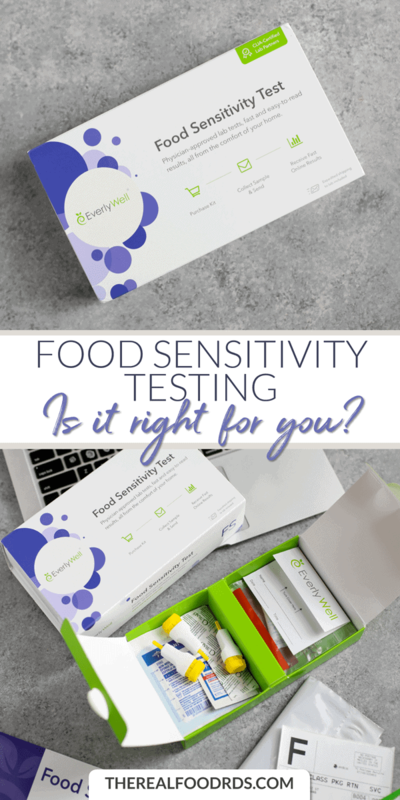 If you suspect that a food sensitivity may be keeping you from feeling your best or you’ve taken a shotgun approach to an elimination diet and still don’t feel like you have any answers, then food sensitivity testing is for you. This post was made possible by our friends at EverlyWell. Although we received compensation for this post, the opinions expressed here are – as always -100% our own. Thank you for supporting the great companies we work with thereby allowing us to continue creating great recipes and content for you. Jessica is a Registered Dietitian Nutritionist living in Boulder, CO with her hubby and two daughters. She’s been described as a ‘real food evangelist’ and loves sharing her knowledge with others to help them break free of the diet mentality and find their own food freedom. In her spare time she enjoys CrossFit, telemark skiing, mountain biking, teaching herself how to play the banjo and camping out under the stars. fitnessvice.com is a multi-platform publisher of health news and information from around the web. fitnessvice.com has earned a reputation for providing the latest health and fitness content that improves the quality of life of its readers.